One of the most talented entrepreneurs of his generation, his career began in the family business at age 25. A few decades and 60 billion euros later, he is the richest man in Europe, and the fourth richest in the world. A family man, passionate philanthropist and smart businessman, Bernard Arnault is the CEO of the LVMH Group which has a market capitalization of 144 billion euros. Leaders League takes a look at his exceptional journey. The career of Bernard Arnault began in 1949 in Croix, an opulent town in the suburbs of Lille. The son of Marie-Josèphe Savinel, originally from the Auvergne region, and Jean Arnault, an École Centrale engineer and owner of a public works company, Bernard Arnault was born into the world of business. Raised by his own admission in a "strict Catholic-Auvergne" style by his grandmother Maminette, he learned to be thrifty. After preparatory classes at Lycée Faidherbe in Lille, he was eligible for the École Polytechnique entrance examination, but was unable to take the physical tests because of a broken arm. No big deal. Although he had been offered a place at the Ecole des Mines, he re-took the École Polytechnique entrance examination the following year and finally joined this prestigious establishment in 1969. That was his first exploit. At the age of 25, he joined Ferret-Savinel, the family business founded in 1926 by his maternal grandfather Étienne Savinel and headed by his father from 1950. As he usually did, he quickly took matters in hand and persuaded his father to sell the construction branch of the company to start a new business. After major restructuring, his father agreed to the idea and so he then had capital to play with - 40 million francs to be exact. Ferret-Savinel became Férinel, and a successful real estate development company was born. Confident and boosted by his success in France, in 1981 he left for the United States to launch Ferinel Inc. But this adventure in the land of Uncle Sam did not meet with the success he had anticipated: Bernard Arnault returned to the France in 1984...and thus began the entrepreneurial saga and the immense success for which he is now known. He turned to the luxury sector and bought Agache-Willot Financière with the support of Antoine Bernheim from the Lazard bank. At the time this trust company owned Boussac Saint-Frères, a major textile player in the North of France, brands such as Christian Dior and Conforama, and the Le Bon Marché department store in Paris. Back then the textile sector was struggling. In order to get the company back on its feet, between 1982 and 1985 the government granted the Boussac Group subsidies of almost one billion francs. Bernard Arnault undertook major restructuring keeping only Christian Dior and Le Bon Marché, which were to become the spearheads of his empire. An inspired acquisition costing 40 million francs ‒ the bulk of the family fortune ‒ which made the French boss the proud owner of a company valued at eight billion francs in 1987. The same year, he bought into the capital of LVMH. Asserting himself as the company’s strongman, he acquired a 25% stake in 1988. Taking advantage of the dissent between Alain Chevalier and Henri Racamier, the two co-presidents of the group, he successfully made a takeover bid that propelled him to the head of the luxury giant in 1989. 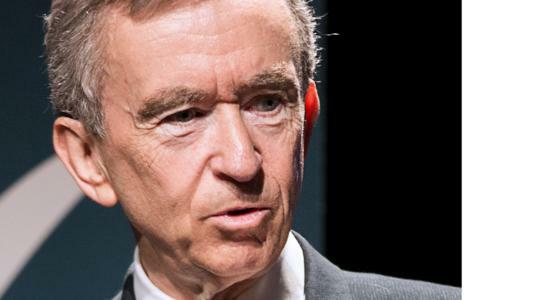 Since then, Bernard Arnault has continued to apply his governance principles: decentralization of decision-making centers for each entity in the group so they retain their identity, and financing the growth of new brands by those already well established. The results are incontrovertible: the value of the group increased fifteen-fold and turnover rose by more than 500%. Win, conquer, triumph. These words could describe Genghis Khan or Attila, but they also apply to the personality of the richest boss in France. For Bernard Arnault, it is not only a question of achieving financial success, but also of leaving the competition on the starting blocks. And don’t talk to him about Bill Gates or Steve Jobs, Microsoft or Apple, which he believes will have "a much more ephemeral life cycle than that of often centenarian companies." Tech is one of the few markets where the native of Roubaix does not weigh in with an opinion. Perhaps because for him theres a sense of been there done that – he invested in 30 million dollars in Netflix in 1999. Francis Bacon said "knowledge is power" Bernard Arnault must have taken note.